Informed by extended research and scholarship, the video and sound installations of Nevet Yitzhak combine archival, photographic, and found materials transformed through digital animation, editing, and sound treatment. With a critical examination of complex geopolitical concerns and the fraught relationships between global powers and the Middle East, Yitzhak’s practice raises questions about cultural heritage, suppressed histories, collective forgetfulness, and identity. Living in Israel as a Jewish artist of Kurdish, Syrian, and Yemenite heritage, she creates work that responds to her context, expressing her minoritized position within Israeli society and her dissent from its current politics. 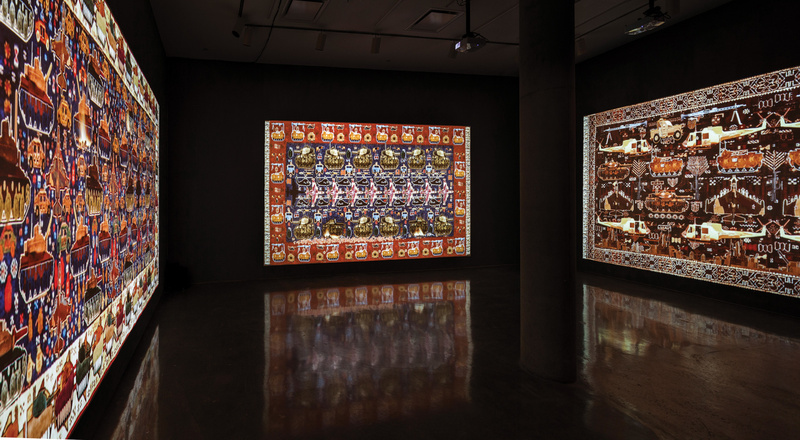 In her three-channel video installation, WarCraft (2014), Yitzhak makes a poignant statement against war and aggression. The artist looks to the Afghan war rug, a unique product of the region’s traumatic history of conflict and foreign military presence, as a departure point in exploring the significance and potential of this unconventional medium to protest violence and occupation. The circumstances that determined the emergence of the Afghan war rug remain uncertain. Its origins can be traced back to the 1979 Soviet occupation of Afghanistan, when weavers began to infuse traditional patterns with imagery of war. At first, the new designs were mostly hidden within a stylized iconography, communicating a subtle act of resistance to the invasion and documenting the weavers’ experiences and interpretations of regional politics. With the rug’s increasing popularity, this instrument of defiance was commercialized. The imagery of war became more conspicuous and detailed, often including English phrases. The term “war rug” was coined by dealers, collectors, and critics, who drove the formation of a prominent souvenir industry. Breaking with tradition to become a testimony of regional conflict, this artefact came to represent a modern fissure within the cultural continuum. Subsequent wars and invasions all permeated the Afghan rugs, introducing contemporary narratives. Articulating a new formal and symbolic language and discarding age-old conventions, Afghan war rugs epitomize the counterpoint of craftsmanship and modernity. They express the fracture of the traditional object. Yitzhak’s WarCraft extends this fracture and repositions the artefact within a broader geopolitical framework. Born in Israel yet unable to rely on points of reference within a society whose mainstream, Eurocentric discourse marginalizes her culture, the artist looks to the Arab world of her provenance for kindred forms of expression. 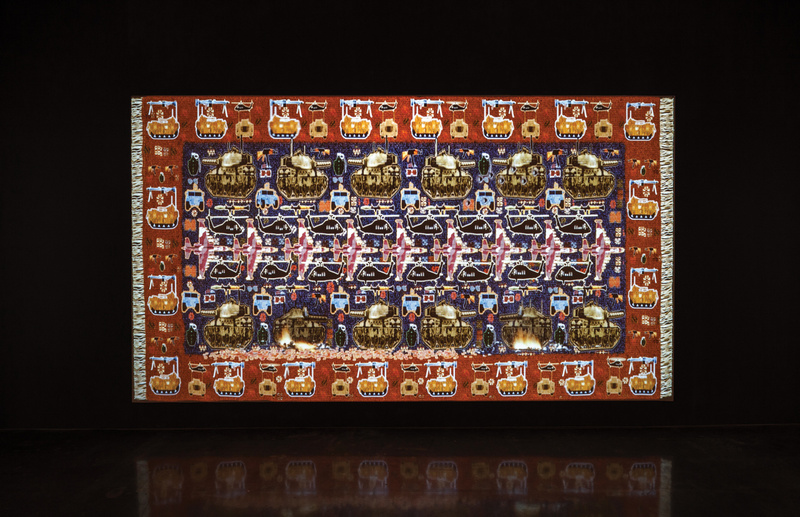 The current reality of armed and territorial conflict informs her experience and work, which attempts to generate a new kind of document that emulates the codified messages embedded in the original war rugs to communicate across borders about shared concerns. 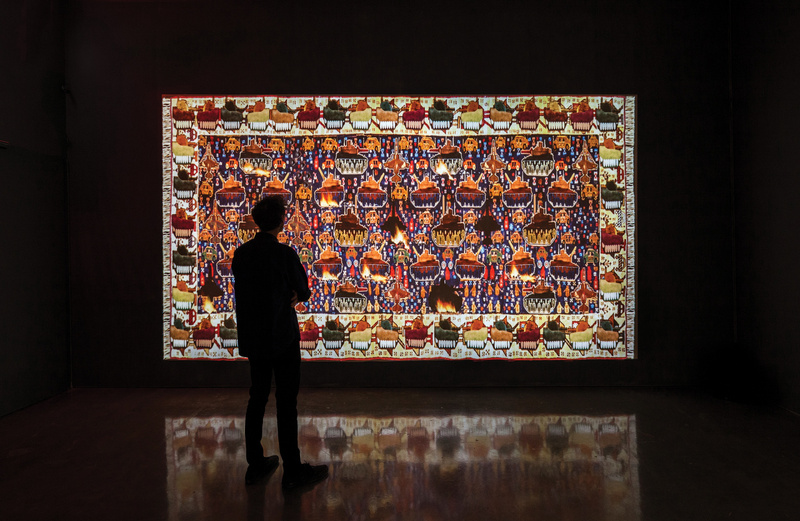 The installation comprises three large-scale projections of digitally constructed rugs. Reimagining their iconography to reference contemporary war zones, Yitzhak introduces 3D models of weaponry deployed by existing armies and battlegrounds. Her laboriously detailed flying helicopters and rolling tanks invade from one rug into the others, surrounding the viewer. 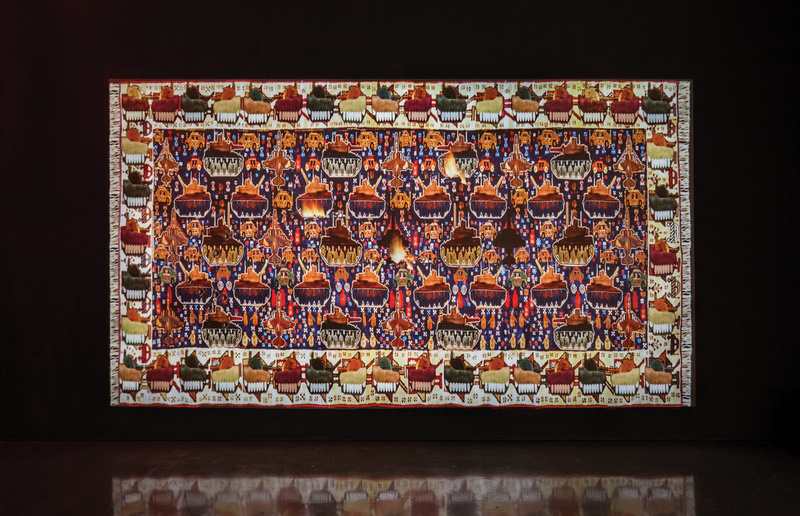 Translated into a new medium, these digital designs pay tribute to the traditional war rug’s intent while moving from cultural specificity to address other conflicts and articulate a bold indictment of aggression. Through visual effects, war machinery animation, and orchestrated gunfire sounds, Yitzhak’s digital patterns expose a vastly destructive potential. Integrating gaming audio and visual aesthetics, her installation links the battlefield to virtual space, reminding us of the ubiquity of war imagery and of our numbness to its violence.